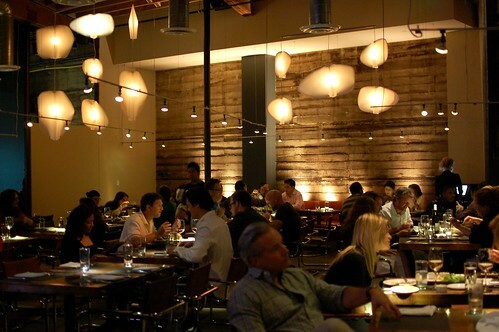 Culver Boulevard is lined with many restaurants, not all of which are worth your time. 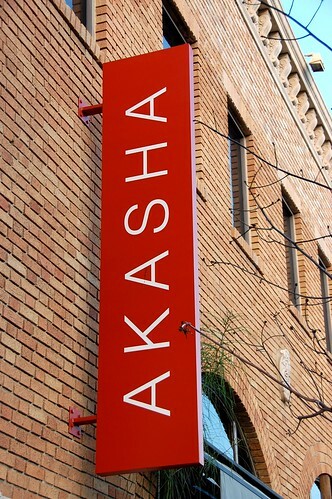 Sustainability is a big theme for Akasha, from its ingredients to its building's design. The restaurant prides itself in supporting "small family farms, organic growers, sustainable and fair trade companies, and artisan food makers." 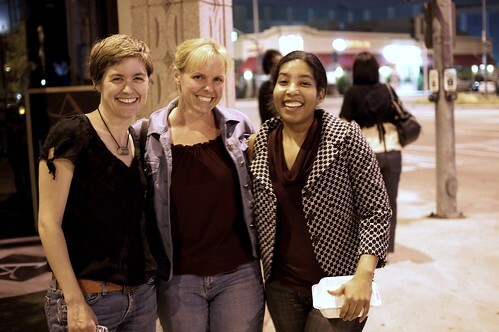 I pride myself in having fun with friends. It's a good combination, especially when those friends share food. Loved my Slumdog Passion ($12). 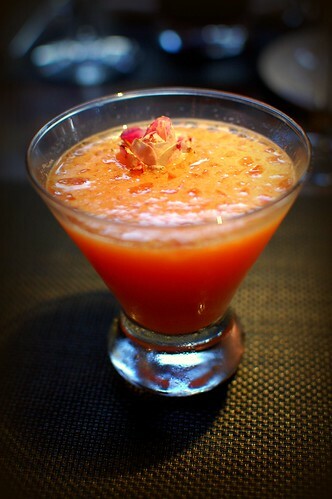 Tru lemon organic vodka, passion fruit purée, pineapple juice, blood orange, and agave. Yes, yes, yes. YES. 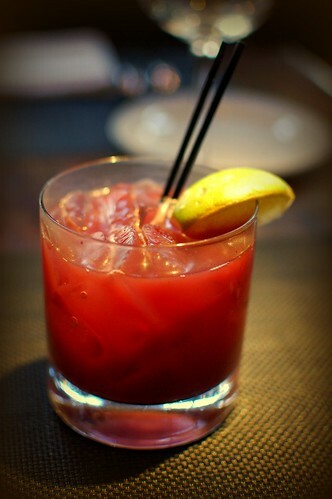 Veev, Sambazon acai juice, fresh lime, and agave. Definitely gave my drink a run for the money. 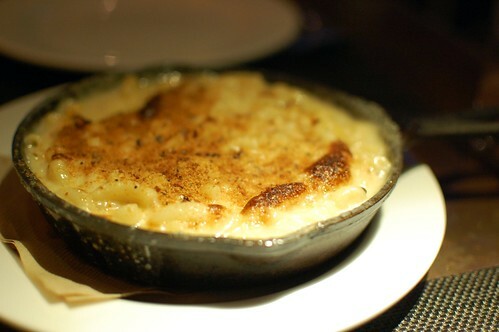 Organic macaroni and cheese with toasted bread crumbs ($8). It looked so great, but it didn't taste as good as it looked. Slightly on the bland side and not as rich and cheesy as an awesome mac 'n' cheese should be. It made us a bit worried about what was to come. La Quercia prosciutto, gorgonzola, fig, caramelized onions, and wild arugula pizza ($15). 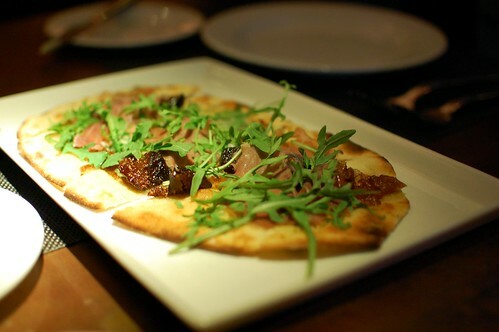 This little pizza definitely helped the restaurant rebound back into our good graces. The juxtapositions -- salty and sweet, crispy and chewy, meaty and veggie -- worked wonderfully. 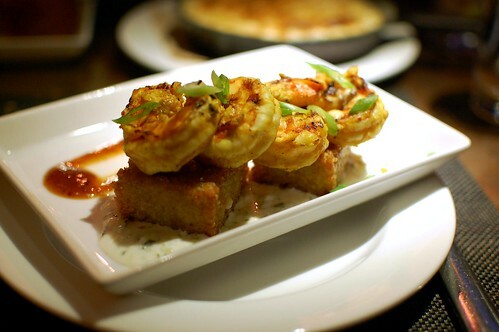 Fisherman's Daughter masala shrimp, tomato chutney, mint raita, and bamboo rice cakes ($12). Gorgeous specimens that paired well with crunchy blocks. I just wish there'd been more. Niman Ranch lamb sliders, sheep's feta, wild arugula, and tomato chutney ($11). I'm sorry, but I'm drooling too much remembering how much I enjoyed these to give you a coherent description. 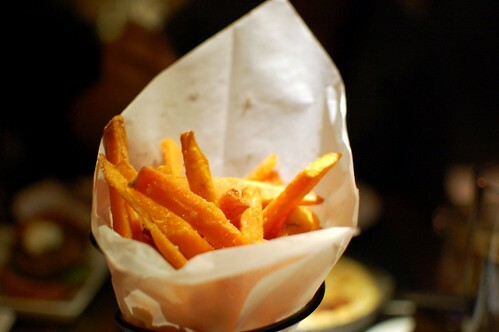 Sweet potato fries with pink sea salt ($6). Pleasant accompaniment, but not particularly noteworthy. 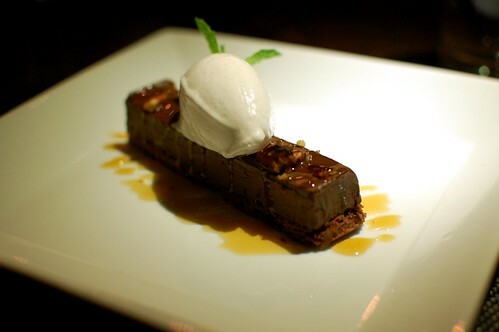 Salty chocolate tart with sea salt, caramel, pecans, and soy vanilla crème ($9). I can't remember if my cohorts liked this or were meh about it. I skipped the chocolate. 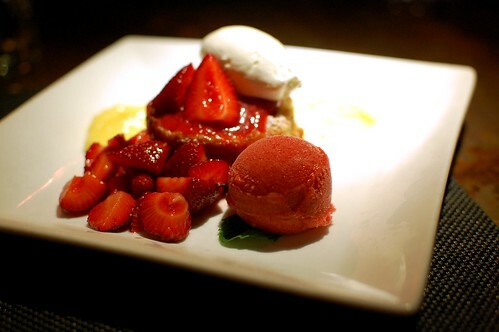 Flourless lemon torte, market strawberries, rhubarb sorbet, and whipped cream ($8). The strawberries were so fresh and delicious that the torte almost seemed like an afterthought. But I was ok with that. I like when the quality of ingredients really stands out. And good strawberries make me smile. Overall, we were pretty happy with our post-work treats. I liked the atmosphere, too. Thanks for a great night, pdx, AJ, and insomniac! I love that you used "juxtaposition" to describe your food. I want a slumdog passion. looks delish. esp. the shrimps. i've heard good things about akasha. must go. Weez, stop taking such good photos! 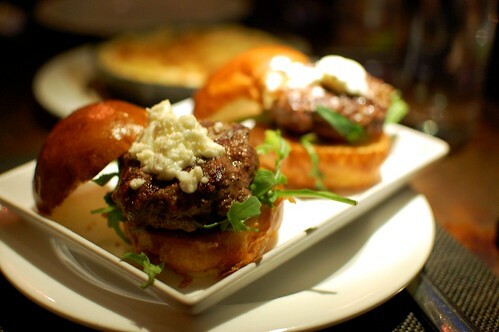 I'm not even hungry and I'm drooling over those lamb sliders like a Pavlov dog! And now I'm super hungry. Thanks :-P P.S. I like the last photo. 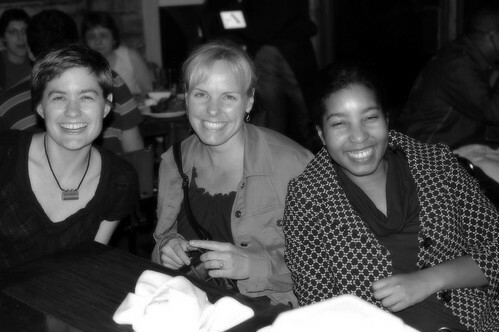 Your friends all look so happy, which is exactly how I feel every time I'm around you. I want that salty chocolate tart in the worst way. Great photos as always! 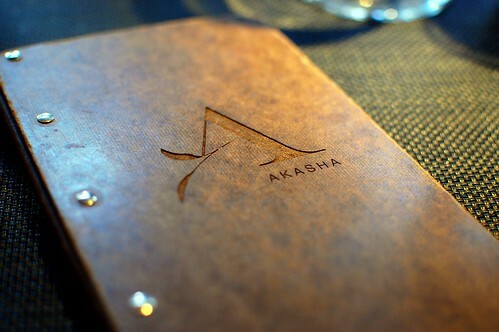 :) Thanks for the review of Akasha. It's been on my "to try" list forever it seems... I just never get around to going. what a fun dinner with even more fun buddies! Darn, I did it again... reading your blog when I'm starving. Waah! The food looks delicious. Yum. Exile, I would still recommend Akasha even with the misses. The hits are worth it, and there are still so many things I hope to try -- we just ate a few small plates. these are your best food pics thus far. fantastic job! That last photo is fantastic! Those cocktails look amazing! I kind of want to try my own version of the first one...passion fruit is so delicious. you had a much better than I did. Never got the gist of this place, not even when we stopped by. However, it was a J Gold 99, and I had to finally eat it. Got the lamb sliders. eehhnnn..
At first I was bitter that you came to Irvine with MM'ers and didn't tell me. Culver is a big street in Irvine. Anyway, the drinks and food look fantastic, my guess is the company made it even better. you should go to titos tacos in culver city. i think its on washington, be ready for a long line but the tacos are so worth it!